Time flies, when you’re having fun, the saying goes. And we must have had a lot of fun, since it’s again that time of the year to commemorate the Battle of the Greenfields and it’s Hobbit hero, the one who singlehandedly beat the Goblin Chief. I’m talking ofcourse about Bullroarer Took Day! We celebrate this hero’s brave deeds each year on March 17. And this year, that’s a Friday! So I conferred with GDF’s moderator, Miss Lina Willowwood, and we decided to move Green Dragon Friday to Brockenborings again. As for the entertainment, it would be nice to have songs, poems, stories related to Bullroarer Took and/or the Greenfields battle. It’s okay to perform last year’s dedicated songs and poems again, you do not absolutely have to write new material, but doing the latter can count on much appreciation, ofcourse. Another thing to think of is the traditional “wearing of the green” on this day. We ask you alll to wear green clothes, cloaks, hats and what have you. 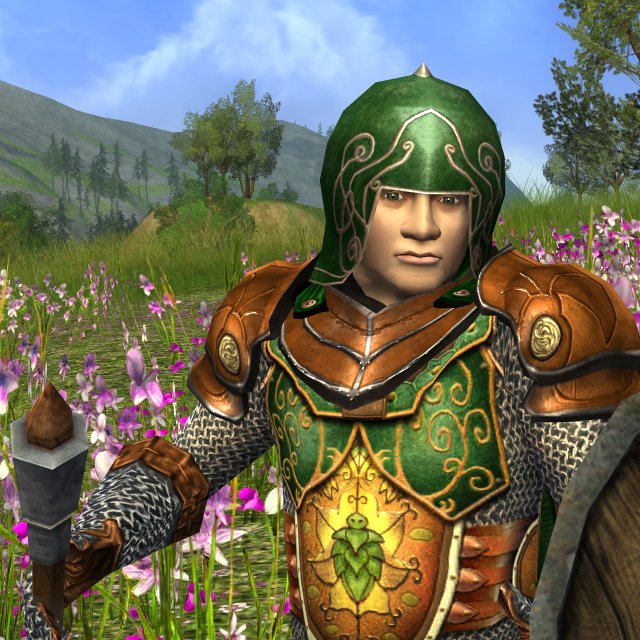 Bullroarer Took Day is Lotro’s implementation of St. Patrick’s Day, hence the date and the wearing of the green. We hope to meet you all on the 17th! All includes hobbits and all other races.